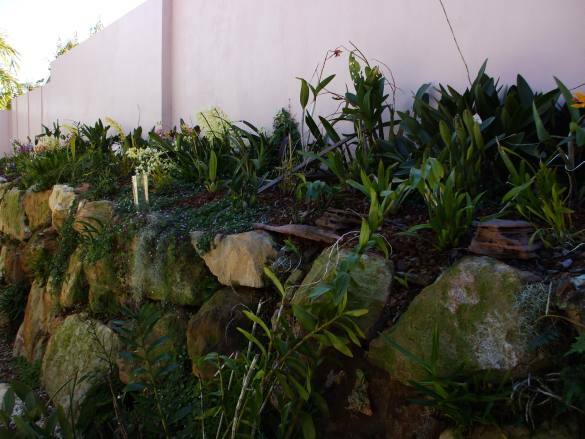 After selling the residue of my orchids, we moved down on to the coast and the house we have has a rock retaining wall along the back and up one side, the back one being 1.8m high and 2m deep and the side one 1m high and 1m deep, both about 20m long. The side wall is 1m from the house and the back one varies from 1.2m to 4.5m and is easily viewed from inside the house. The orchids we brought with us out of our other garden on Tamborine Mt were put in with the original plants but the original planting was not much and it cried out for orchids on and in all the crevices in the wall, so off we went to buy more orchids, who would have thought after selling so many orchids that we would be buying more.This was in early 2008. The minimum night temperature drops to about 4 or 5 C, on the Queensland Gold Coast,Australia,the orchids are out in the open and some are shaded by tree ferns. They are planted in coconut fibre and bark with a bit of compost thrown in, they have been in now for 2 years and seem to be doing alright,there are some photographs of the start of planting and as they are today and some hopefully as they will be in the future. Now in 2010 we are using bark as the coconut fibre is washed off in heavy rain and also when it is dry the wind blows it around. It is not very stable for plants without a pot and stakes look very untidy,as the plants grow they really anchor themselves into the ground and the roots go everywhere, rather from pot to pot as they do on a bench. As they flower for so long we often have up to 40+orchids in flower st the same time, it is like a permanent display at an orchid show. I came across your site and began reading about the project you have undertaken with your rock wall. I was amazed at how successfully you have integrated so many different orchids in the wall. Well done it is very impressive. I noticed that there was one dendrobium which was dark pink almost purple and simply labled Dendrobium Nobile. I am interested in this as I have a similar plant and am trying to identify it a little. Are you aware of the variation at all? Is this the complete name of the plant? I would appreciate your comment and any info you have. Hi Michael, thanks for your comment, orchids are great plants to work with. Regarding Dendrobium nobile which since it’s discovery has been widely used in breeding these so called ‘soft cane dendrobiums’ and a lot of them look so much alike so are very hard to identify. There are two forms of this Dendrobium that have been given specific status, Dendrobium cooksonianum and D viginalis. The canes are green and soft and they flower at each node or sometimes will throw a keiki new plant wich will be identical to the parent plant. Most flowers of Den nobile are pale pink sepals and petals, sometimes with reddy pink edges and the labellum is the same colour but is very dark purple in the throat. I am the newsletter editor for the Species Orchid Society of WA, and came across your article and photos of orchids in your garden. I have written a series of articles for our members on growing orchids in your garden, and would likle to use one or two of your photos (source will be properly acknowledged of course) and refer our members to these pictures and accompanying articles on the Orchidfiles website. While our climatic conditions are less favourable than yours, I have been growing species orchids on trees for several years and thought that it was time that our members that either don’t have the space or the income to erect and operate a climate controlled (heated and cooled) glasshouse were made aware of some other options. As many of us age and move to smaller property, we are faced with real space constraints and your approach to solving this problem is refreshing, and I feel could have wide application for some of our members (and myself at some future date!). Congratulations and thanks for the work to date. I look forward to reading more over time. Editor, Species Orchid Society of WA. Really pleased you appreciate the website. I have grown orchids for many years,started 2 orchid societies and had a n orchid nursery on Tamborine Mountain in from the Gold Coast. 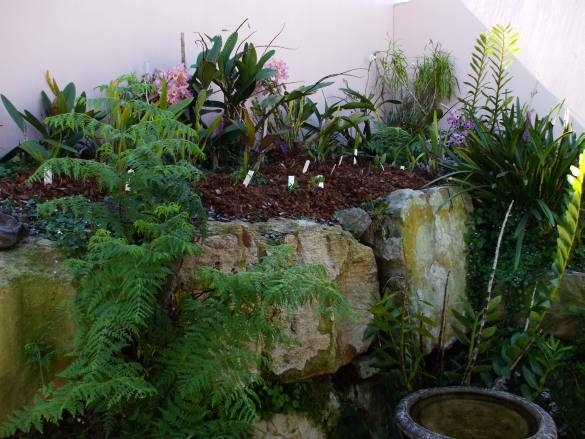 I eventually sold all my orchids and downsized to a house on the coast and lo and behold it had a rock wall around the back and one side, just crying out for orchids and that is how it started. But we are very lucky with the temperature, only the occasion 7s or 8s and the tree ferns shade them in the summer. Feel free to use anything off the site as that is what the site is all about. Hi not so far, touch wood. Leave a comment for: "THE ROCK WALL GARDEN."